At Eurocare we understand the importance of installing suitable sanitary waste disposal units in all female washrooms. In order to meet strict UK regulations it is essential that all female washrooms should have appropriate sanitary waste disposal so that sanitary waste can be disposed of in a safe and environmentally-friendly manner. 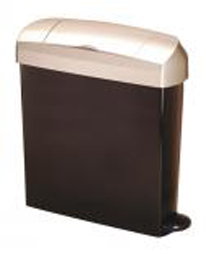 To maintain a clean and pleasant washroom environment it is vital that feminine hygiene waste can be disposed of in a hygienic and discreet way and this is paramount in all of Eurocares’ range of sanitary waste disposal units. All of our sanitary waste disposal units have been designed to fit in with UK legal requirements and to provide the user with the expected level of sensitivity and discretion. If you are an owner of a commercial establishment it is important that you are aware of the legislation surrounding the disposal of sanitary waste, even if you only have one female employee. A legal duty of care for companies to ensure that all sanitary waste produced at their premises is managed correctly up to the point of disposal, is carried by a licensed carrier and that there is full audit trail which is documented and available to be viewed by health and safety operatives at all times. Any failure to do this could result in a heavy fine. Eurocare can make sure that you comply with all the legislation surrounding sanitary waste disposal so to find out more about our range of sanitary waste disposal units and the service that we can offer you please contact us now on 02920 868961.